Since the first century C.E., the most prevalent and popular view for the observance of Passover and the seven days of Unleavened Bread has been Hasidic System B—an interpretation first expressed by the ancient Hasidim. This practice has the Passover sacrifice offered during during the afternoon of Abib 14 with the Passover meal eaten at the beginning of Abib 15. All leavening is removed from one’s home by noon on Abib 14. Abib 15 begins the 7-day Feast of Unleavened Bread and continues through Abib 21. 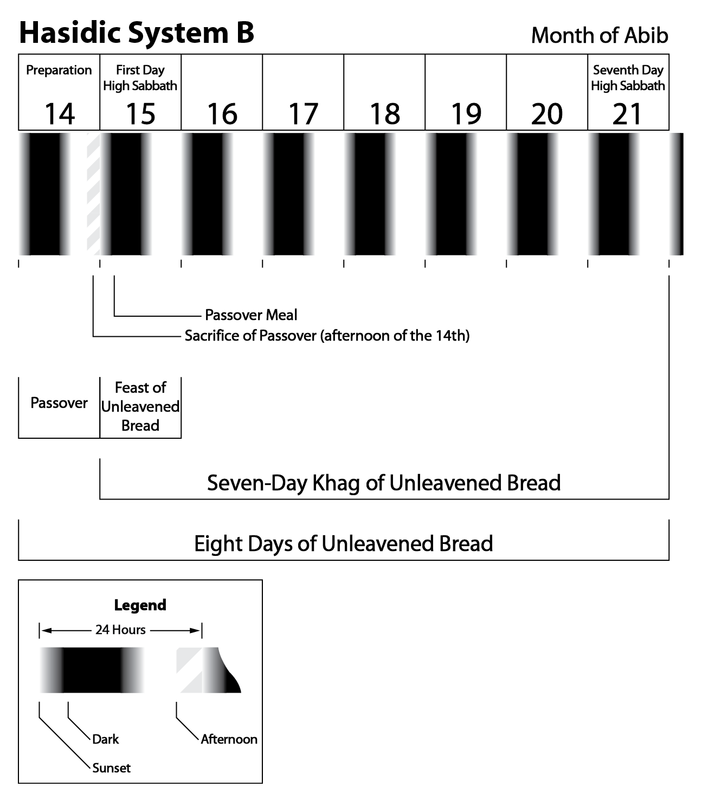 There is a total of 8 days of Unleavened Bread counted from Abib 14-21. • What is the ancient evidence of this interpretation? Also, just how and on what days did they keep the Festival of Passover and Unleavened Bread? • When did this Hasidic view of Passover and the seven days of Unleavened Bread first appear? • What issues created their interpretation and how did they derive their understanding of בערב (be-arab; in the mixing of light and dark [twilight]) and its cognate term בין הערבים (byn ha-arabim; between/among the mixings of light and dark [twilight])? There is little doubt that the group who originated System B, the most enduring interpretation for Passover and of the expression “byn ha-arabim (between the mixings of light and dark [evenings]),” was the חסידים (Khasidim; Hasidim) of the early second century B.C.E. It is important to recognize that the Pharisees, Essenes, Zealots, and other Jewish groups, including the later Rabbinists and Talmudists, are the spiritual descendants of the Hasidim. The Hasidim, therefore, appear in Jewish history at a time of tremendous conflict and turmoil in Judaea. It was a period when the Greeks exerted heavy influence upon the Jews, when various attempts at Hellenization were made (both by Greeks and Jews), and a time of wars. The subsequent division among the early Hasidic groups into such parties as the Pharisees and Essenes (those retaining the name Hasidim)6 took place sometime between 160 and 145 B.C.E. Copies of Hasidic material, such as the Book of Jubilees, were in turn retained and preserved by these new offshoots. This text goes on to say that in Arabic this phrase is referred to as “little evening” or “when it begins to draw towards evening” and is equivalent to the Greek phrase “δείλη προΐα” (i.e., deile proia; early afternoon). This view merely reflects the strong influence of Greek culture upon the developing Hasidic schools after the conquest of Judaea by Alexander the Great. The conservative Jewish schools, as we shall later demonstrate, rejected this scheme as a foreign innovation. • What scriptural issues caused these Hasidim (and later their spiritual descendants the Pharisees, Essenes, and others) to break from the earlier view held by the Aristocratic school with regard to the observance of the Passover? • How did their view of byn ha-arabim affect their construction of the Festival of Passover and Unleavened Bread? The advocates of System B believed that they had found a better understanding of just how they were to observe the Passover and the seven days of Unleavened Bread. Two passages served to be the catalyst for all their interpretations: Leviticus, 23:5–8, and Numbers, 28:16–25. Since the 15th was “a Khag of Unleavened Bread for Yahweh,” the Hasidim reasoned that the 15th was also the night of the Passover supper. If the night of the 15th is the Passover supper, then the under­standing of the conservative priests (the Aristocratic school), which held that twilight after sunset was byn ha-arabim and the period that began the day, came to be judged as incorrect. • The 15th was a Khag of Unleavened Bread. Therefore, the 15th must also have been the first day of the seven days of Unleavened Bread and a high Sabbath. • The evidence was unequivocal that the lamb was sacrificed on the 14th, yet the Passover lamb was also to be eaten with unleavened bread. Therefore, they calculated that the Passover supper was on the 15th, the first day of the seven-day Khag of Unleavened Bread. Since the 15th day, and not the 14th, was determined to be the first day of Unleavened Bread, “within ערב (arab)” on the 21st day had to be explained as the period ending rather than beginning that day. In turn, the expression, “until the 21st day for the moon within ערב,” as the outer limit for these seven days, meant that the word “until” was inclusive of the 21st day. Further, it would have been impractical to sacrifice at twilight on the 14th and then wait over 24 hours to eat the lamb at night on the 15th. To prove that there were two periods of arab—one of which ends the day—those supporting the Hasidic view offered as proof Leviticus, 23:32. It is a Sabbath of rest for you; and you shall humble your nephesh בתשעה לחדש בערב (be-teshuah la-khodesh be-arab), from arab until arab you shall keep your Sabbath. Therefore, it is argued that one begins to keep the Day of Atonement from the arab of the ninth until the end of the arab on the tenth day of the seventh moon (i.e., exclusive of the ninth and inclusive of the tenth). For those holding to the Hasidic view, this statement proves that there is a period of arab in the afternoon of the day. Yet, there were only seven days of unleavened bread. To solve this dilemma, the advocates of the Hasidic view interpret the command to eat unleavened bread for only seven days as relevant only from the 15th through the 21st. Nevertheless, they remove leavening out of their houses before noon on the 14th, prior to the time of their sacrifice of the Passover.25 For this reason, they actually counted seven and one-fourth days of unleavened bread. Time for another break everyone. Be sure to continue with our second part titled 13. Passover – Hasidic Practice II. 2 OTP 2, p. 43; DSST pp. 238–245. 3 OTP 2, pp. 43–45; THS p. 283. 4 1 Macc. 6:20-63; Jos. Antiq., 12:9:3-7. 6 That Hasidim (Khasidim) was another name for the Essenes see 8. Passover – The Dark Period I, n. 32. Outstanding representatives of the Hasidim, also called “men of action,” were Khoni ha-Me’aggel, his grandsons Abba Hilkiah and Hanan ha-Nekhba (B. Taan. 23a), and Khanina ben Dosa, who lived at the end of the second Temple period and whom the Mishnah refers to as the last of the “men of action” (Sot. 9:15, while the J. Sot. 9:15, reading gives “Khasidim”). This evidence demonstrates that the Hasidim continued as a movement until at least the latter part of the first century C.E. 7 GHCL p. 652, #6153, s.v. ערב. 9 CBTEL 7, p. 735. 12 HBL p. 277, s.v. ערב; CBTEL, 7, p. 735. 13 Rashi Com. Exod., 12:6; CBTEL, 7, p. 735. 14 Lev. 16:31, 23:24, 26-32, 39, all demonstrate that sacred gatherings are also called sabbathon days (i.e., high Sabbaths). 16 See above n. 14. 19 Exod. 12:8; Num., 9:11. 21 The Hebrew legal day, which was controlled by the moon phases, begins when the sun has set and the new moon became visible (see THP p. 131, and n. 3; ADB 4, pp. 765f; EWJ pp. 15f, and n. 2, pp. 26f; HBC pp. 9f). Those defiled and unclean had need to bathe and then at sunset, at the beginning of a new day, were once again declared clean (THP p. 199, n. 6). 22 Lev. 16:29-34, 23:27-32, 25:9; Num. 29:7-11; Philo Spec., 1:35 §186; Jos. Antiq., 3:10:2f. 23 Exod. 34:25, cf., 23:18. Accordingly, this was also the understanding in the Mishnah (Pes. 5:4; Makk. 3:2). 25 Pes. 1:4–6; B. Pes. 11b–12b, 21a; JE 9, p. 550; CBTEL 7, p. 737. 27 Augustine Epist. 55:9 §16. This entry was posted on 01/17/2013, 8:11 am and is filed under Calendar, Feast Days, Jews, Passover, Religion, Unleavened Bread, Yahshua, Yahushua, Yahweh. You can follow any responses to this entry through RSS 2.0. You can leave a response, or trackback from your own site. What happened? Are we stunned into silence or really thinking about all this?